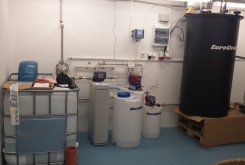 AquaSoftener is used to soften hard water, preventing reliably the formation of limescale. Hard water causes a number of inconveniences, for exaple a whitish coating on appliances, limestone deposits in washing machines, dishwashers and coffee makers, kettles, faucets and sanitary. It also dries out the skin and can negatively impact the taste of beverages and dishes. Limescale in boilers, washing machines and kettles significantly increase energy consumption. Hard water increases the consumption of detergents by up to a half. 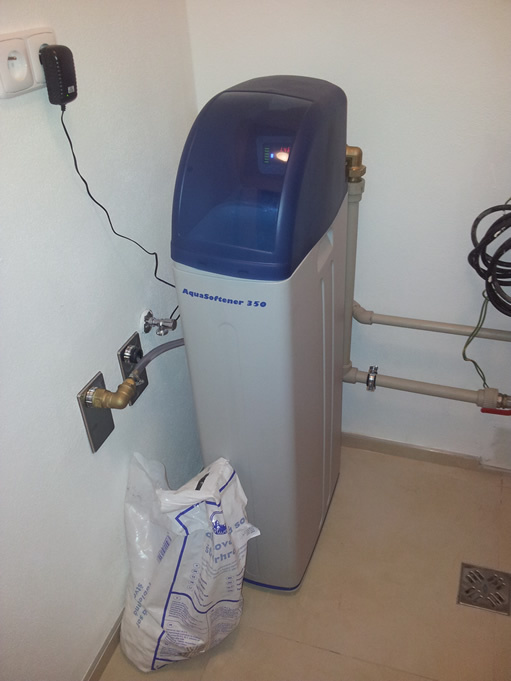 AquaSoftener provides protection against the limescale which would eventually clog supply piping or destroy appliances. Ions causing water hardness are exchanged for sodium ions, which are harmless. The exchange takes place while the water passes through a filter bed in which calcium and magnesium ions are captured. After a certain amount of water is treated the device will regenerate. This fully automatic process lasts 30-60 minutes, depending on the model, and rinses the accumulated calcium and sodium ions. Regeneration is done with brine made of tablet salt, which has to be added to the reservoir once in a while. 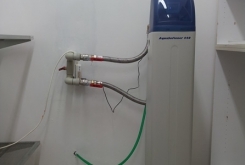 The AquaSoftener is connected to the main water supply of the facility using a bypass. Next, the hoses are introduced into the drain where the regeneration water will be released. The final step is to set up the control valve according to your needs. You can install the device on your own or order an installation from our company. The operating costs consist of the tablet salt, water consumed during regeneration, and the small amount of electrical energy needed for the control valve. Please contact us to choose the appropriate equipment for you and calculate the cost. Regeneration period: depending on the actual amount of treated water with the possibility of time-delaying the start. Thanks for solving the hard water problem. 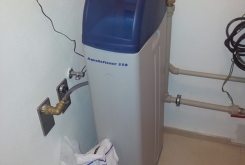 It used to cause us trouble, and we are glad that we chose AquaSoftener. 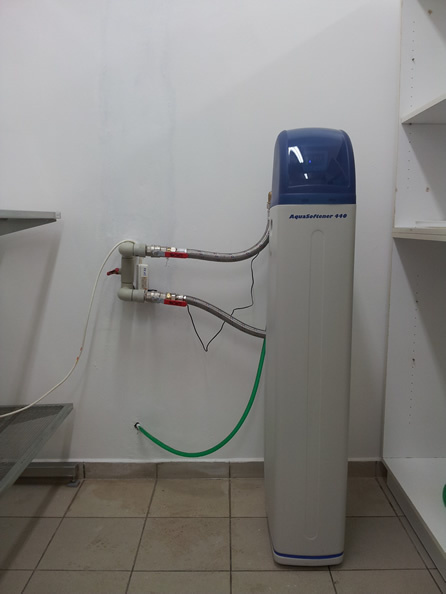 Two months ago we bought the AquaSoftener for our cottage. 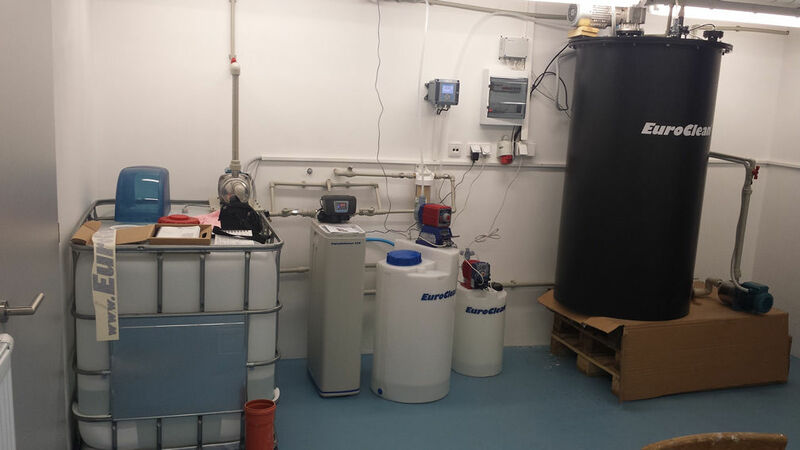 The water values are perfect and water hardness does not bother us anymore. 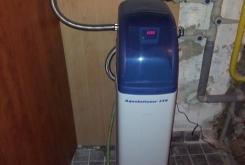 I thank Mr Kočí for helping me choose a suitable softener in a family house and I thank Mr Hoffreiter for the quick installation of the device. Everything works smoothly. Every two years we used to change the heater spirals in our boiler and washing machine. We installed your device and the problem is gone. Thanks for the recommendation and installation! I could not solve this by my self. “If I didn`t have to buy regeneration salt once in a while, it’d be without a flaw :). But still, satisfaction.